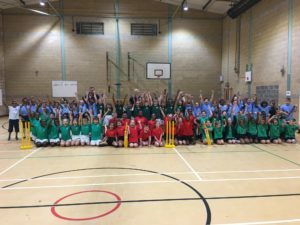 Schools from the Romero Catholic Academy came together to welcome the Warwickshire Cricket Board (WCB) to an afternoon of cricket at Cardinal Wiseman Catholic School. Teams of 15 from each primary school in the academy, which includes Corpus Christi, Good Shepherd, Sacred Heart, St Gregory’s, St John Fisher, St Patrick’s and Ss Peter and Paul Catholic Primary Schools, took part in a coaching session with WCB. Pupils then enjoyed a round-robin tournament led by the sports leaders at Cardinal Wiseman School, who refereed and umpired the games. It was the children from St Patrick’s Primary School who were triumphant in the tournament, and were each presented with a medal to mark their achievement. The event not only gave the primary school children an opportunity to learn new skills, but also gave them a taster of secondary school life. WCB cricket coaches are now due to work with Year 4 and 5 pupils across all seven Romero primary schools during the spring term as part of the Chance to Shine cricket programme, which looks to encourage more young people to take up the sport. Rhye Parry, PE and Wellbeing Co-ordinator at the Romero Catholic Academy, said: “The event was an excellent way to bring primary school children from across the Academy together to enjoy an afternoon of cricket. “We aim to give both boys and girls the opportunity to take part in a variety of sports to develop their skills as part of a well-rounded education. We work closely with the Warwickshire Cricket Board and were delighted to welcome them to host a coaching session for the pupils.